Find answers to frequently asked questions about publishing, writing, and marketing. If you have any questions we haven’t covered please send them to us at info@indiebooksintl.com. What is the Difference Between Ghostwriters and Editors and Indie Publishers? How Do I Choose the Right Publisher For Me? How Can I Get Financing for Publishing My Book? Do Negative Book Titles Sell? What are the Formulas for a Bestselling Business Book? How Does Book Ghostwriting Work? How Do I Make My Book More Persuasive to Prospects? How Do I Get Clients to Agree to Case Studies? How to Attract Clients with Amazon Book Reviews? How Can Authors Conquer Fear of Public Speaking? What Are the Problems with Marketing a Book? How Do I Use the Book to Get Speaking Engagements? How Do I Sell My Book from the Platform When Speaking? How to Build a Prospect Database to Market a Book? What is the Best Database for a Consultant or Coach Author? What is the Biggest Mistake Consultant and Coach Authors Make? You’re invited to join us at one of our upcoming events. Learn best practices for marketing your book, network with other authors, and more. Who Are You? What Do You Do? How Can You Help Me? Attract more prospects, clients, and work engagements that align with your strengths and interests by using your Defining Statement, Defining Paragraph, and Defining Story. 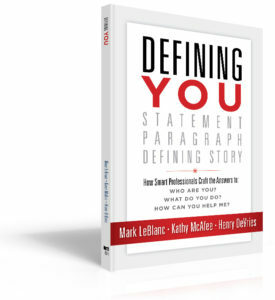 Download the interactive worksheets outlined in Defining You to help craft your statement, paragraph, and story.